One major drawback, for some, of the Scholastic Storybook Treasury series is the somewhat staid voice-over-top-of-pages-from-the-book thing. While we love the vintage feel of that kind of book-to-video presentation, generally preferring it to the slick computer graphics of today, I can see why it may leave others feeling ho-hum. This new Mo Willems Cartoon Collection is exciting because while it’s mostly the pages from his books with the author’s voice on top, it’s also much more, well, cartoonish (in a good way, not the silly way, although it is silly, in a good way…oh nevermind). There’s moving animation using brand new cells and drawings not including in any Willems’ books, and fantastic music – the kind heard in old-school Saturday morning cartoons: crashing, honks, squeaks. It’s all so entertaining! The title story’s opening dream sequence together with the final scene, a chat between the bus driver and pigeon regarding the high-tech features of the latest bus model that may leave some kids scratching their heads (but will crack up the parents), are worth the price of admission alone. But wait…there’s more! Included along with Don’t Let The Pigeon Drive The Bus, is Willems’ modern-classic Knuffle Bunny and Leonardo the Terrible Monster, the later of which has engrossed the Mouse. She loves all the other, more terrible monsters and watching the ridiculousness of Leo attempting to scare Sam. 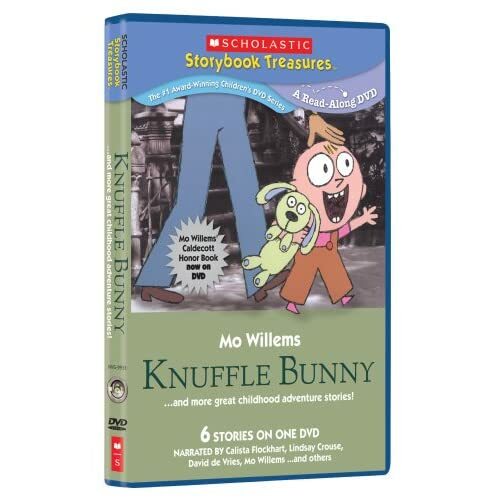 Knuffle Bunny is still clever & adorable (and was previously the title tale of another DVD – reviewed here) and the other two stories are so fresh and so great. All together, they make this DVD one of the best ever from Scholastic. 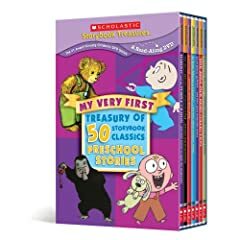 This latest Scholastic Storybook Treasures DVD is essential viewing for any Mo Willems enthusiast. Thanks to new artwork and “added scenes”, Don’t Let The Pigeon Drive the Bus is a must-have addition to your family’s media library. *Don’t Let The Pigeon Drive The Bus was provided to OWTK for review. The opinions expressed above are unbiased and true – no arm twisting took place in the review process.